Is Copper Better Than Plastic? Traditonally copper has been used for manufacturing pipe used for carrying water and gas for many years. However in recent years plastic is becoming more popular. Many people do not trust plastic to do the job, is this justified? In the right place plastic pipe can have many advantages over copper or other metal pipes. Plastic is lighter, more flexible and quicker to install and can be used in long lengths with fewer joints than metal pipes. It is also less attractive to metal thieves who are becoming increasingly prevalent. One of the problems with copper is that it can fail due to erosion or corrosion, leading to leaks and considerable damage. This week I have attended two jobs where copper pipes have failed, the first was a restaurant where the incoming copper water main had failed underground. When the pavement was excavated we found the copper had corroded away until it was paper thin with the obvious consequences. 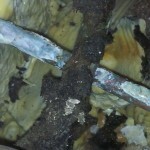 It would have been impossible to instal a new copper pipe without major building work. Replacing the copper with Buteline pipe was a far simpler job, with the advantage that the replacement pipe will be immune to corrosion. The second job was in an old building converted to flats. One of the ground floor flats reported damp on the kitchen floor. On investigating the basement, it was clear that water was leaking from under the floor of the flat. 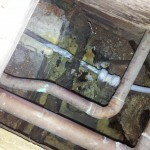 In the photos above the limescale formed under the floor can be seen. The pipe had previously been repaired approximately four years ago after a pinhole had formed. The copper had failed again where it enters the pushfit coupling. The copper has now been replaced with plastic. It is clear from the above case studies that copper is not foolproof, although there are occasions where copper has to be used there are also scenarios where plastic is a far better alternative.